As your child grows, he or she will likely begin to show a preference for one hand or the other. While your two or three year old might switch back and forth between one hand and the other, by the age of four it should be fairly apparent which hand your child prefers. However, some children do have a more difficult time choosing and exercising a preferred hand. If this sounds like you child, he or she may need help strengthening one hand or the other in order to establish a dominant hand. A dominant hand is exactly what you might think it is. Nearly every person prefers to use one hand over the other for most tasks. This hand is referred to as the dominant hand. For the vast majority of people, the dominant hand is the right hand. That said, many people prefer to use their left hand and there is absolutely no reason for them to do otherwise. Why is it important for your child to establish a dominant hand? Establishing and strengthening a dominant hand is important because it prepares your child for complex tasks such as writing and cutting. A child who has yet to choose a dominant hand by age 5 or 6 may have trouble learning age-appropriate skills, causing them to fall behind in school and sometimes this leads to feelings of inadequacy and a lack of confidence in the classroom. While some people do get along just fine without a dominant hand, ambidexterity is not typical. In general, it is best to encourage children to choose and train a dominant hand rather than allowing them to grow up with two hands that are less able. How can you help your child strengthen their dominant hand? This information often leaves parents wondering what they can do to help their child choose and train a dominant hand. There are many ways to go about this. Below we have included the basics so you can get started right away. Begin by observing your child in order to find their preferred hand. Do not encourage your child to use one hand over the other during this period. Instead, stand back and take note of which hand your child uses for eating, grooming, playing, and colouring. After a week or two of observation, you should have a pretty good idea of which hand your child tends to prefer. Encourage your child to use and exercise the preferred hand. This can be done by offering opportunities for a wide variety of games and activities. For instance, you might offer your child clay to mash, crayons for colouring, a tea set for pretend play, or a ball and bat for hitting. While your child is playing, remind them to use their “doing” or dominant hand. If their hand becomes too tired, instruct them to take a break rather than switching to the other hand. Another way to help your child establish a clear feeling of dominance in one hand is to encourage them to cross the midline. This can be done by placing toys on their non-dominant side and asking them to move them to their dominant side using their dominant hand. This exercise works well with blocks on one side and a tower on the other, or a puzzle positioned in the same way. Other options include asking your child to clean a kitchen table or the windows, as well as drawing large pictures on a blackboard or whiteboard. By encouraging frequent use of the dominant hand, you can help prepare your little one for school and the future beyond. 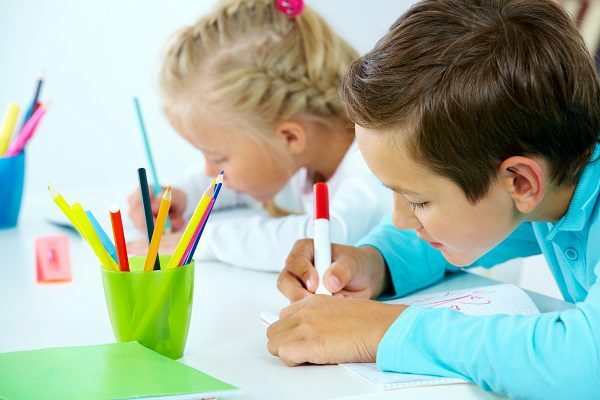 Do you have questions or need help working out if your child is left handed or right handed? Kids First Children’s Services’ occupational therapists are here to help! Contact us on (02) 9938 5419 to chat about your child’s needs.